Thank you for sharing your vision.looking forward to book release. Hello Deitra. Glad you stopped by the Letting Go Cafe and see the vision. Hope you will return and peruse our content. You might appreciate THIS article, given the focus of your not-for-profit. Hi Melanie. Thanks for visiting and leaving a comment. Good luck at your February 7th seminar event in Texas. I think you might appreciate s couple of the featured bloggers we have at the Letting Go Cafe. For example, we have Michelle Rosado and Jeff Davidson. They are both wonderful. Equally wonderful is ELisha Vee. Click on their names and check out their articles. I believe you will enjoy them. Again, thanks for visiting the Letting Go Cafe Melanie. with any kind of information on the topic of wordpress theme builder and came across lettinggocafe.com. Thanks for posting this helpful info. Great items from you, man. I’ve bear in mind your stuff prior to and you are simply too great. I really like what you are stating and the way in which in which you are saying it. You are making it entertaining and you still care for to keep it smart. I can’t wait to learn far more from you. This is actually a terrific site. Hi Judith. Your comments are very much appreciated. Feel free to share the rss feed for the Letting Go Cafe on your website. All the best and thanks again for visiting the Letting Go Cafe Judith. Hi Abby. We are considering a donate button. But for now, we really want to simply offers solutions for letting go and be a great resource for our subscribers and others. But its a great suggestion!! Take care. HI Chante. SO glad you visited the Letting Go Cafe. Glad this was worth sharing with your other communities. Looking forward to your comments and posts. A fascinating discussion is worth comment. There’s no doubt that that you should publish more about this issue, it might not be a taboo matter but typically folks don’t talk about issues related to letting go. To the next! Cheers!! Hi Lindsay. Thanks for your general comment. You are exactly right. Many people don’t like to “air their dirty laundry” (so to speak) when it comes to sharing life challenges. However, what I have also found is that people will lurk in the shadows and look for solutions to their situations. While it might be done privately, they still need to have a way to find solutions and remedies for letting go of stuff. And that is what the Letting Go Cafe is all about – offering solutions to those seeking methods and information about moving on. Thanks again for your comment Lindsay. I like what you guys are up too. Such smart work and reporting! Keep up the superb works guys I have incorporated you guys to my blogroll. I think it’ll improve the value of my website :). “Live among men as if God beheld you speak to God as if men were listening.” by Seneca. I found this blog very usefull and I just wanna say thanks. I hope you keep up the perfect work! Hi BK. Thanks for your interest in the Letting Go Cafe. Please share the blog with your friends and others. Hi Ethel. Thanks for visiting the Letting Go Cafe. Just want to share with you some of the other posts at the cafe. Decluttering, People and letting go, letting go at work. and you will get updates every time we post. Glad that you appreciate the Letting Go Cafe. to visit and share your letting go experiences with others. Either way, we appreciate your visit to the blog site. that was helpful for your letting go adventures. All I can say is keep it up. This blog is so necessary in a time when everyone just desires to talk about how numerous men and women someones cheated on their wife with. I mean, thanks for bringing intelligence back to the internet, its been sorely missed. Great stuff. Please keep it coming! Thanks qwerty. I will do just that – keep it up! I almost have to blog about this topic as it is very near and dear to my heart. Thanks again. I was just browsing the web and stumbled upon this nice website. I would like to let the webmaster know that they are doing a great job with this website. I am also working to develop my own website as well. Thanks for browsing. Come back as there will be more. Much more. Hi guys I have been lurking around this forum for quite some time and my laziness was preventing me from signing up. Finally I have managed to signup. Oh I forgot to introduce myself. I am an finance graduate and I am looking to do my PHD in the same field. See ya. Thanks for visiting my blog. Come back. Check in. And take look at all the other pages on the blog. Good stuff (or so I am told). You are most welcome. Thanks for visiting the blog. Check out some of the other pages on this blog. Its good stuff (or so I am told by other bloggers). Thank you for visiting the blog. Hope you come back and check out some of the other pages. You are always welcome. I like Your site. It is interesting. Do You have RSS I want to add to my favorites. I hope that my input has been substantial. I’m a newbie in this forum, actively finding topics that i’m knowledgeable with to discuss and ask for advice. I’m sure i will learn a lot from this forum. Alright, will participate in some of the threads soon. Music of Michael Jackson is going to live for ever no matter what, I think It’s became a legendof ‘pop’, He was so depressed last time and has lots of problems, poor guy – that was probably end for him – so sad all we can do is keep his music in our hearts. I just wanted to comment on the contribution of this community here. It’s great. Very helpful and positive forum, I have already learned a lot from just reading? Wow such an unexpected loss! The by world stood at rest to judge goodbuy to Michael! He is Elvis of our days!R.I.P MICHAEL! I agree. Michael Jackson’s death is a substantial loss, in particular to the music industry. Imagine, now one else has ever sold 25 million albums in one year – EVER. Not Elvis, not the Beatles, not Madonna, -NO ONE. He is unsurpassed in the accomplishments within that industry. From this perspective I believe his loss is great!! I wish I could help you with this one as well, but unfortunately, if you don’t want to talk about something related to this BLOG site; something that is not technically based, then I am afraid I won’t be of much help. My expertise lies with subjects like: diversity, team development, letting go of stuff, and the like. Why can’t people be nice instead of all the sniping? Those of you that know me from the other forums, remember that I used to have some pretty severe self esteem issues because of health problems. Well now I am doing much better, out of therapy, and looking forward to returning to life, blogging, posting online and getting back to normal. I appreciate everyone’s support through these tough times. Thank you for this article. Now this site in my rss reader. Hi, I just became a part of this forum here and I would love to be a part of it. Seriously, love the contribution of the community. Thank you for your comment. I believe it is important to make a contribution, not only to the community, but to our selves. More of us need to be willing to deal with the person in the mirror, without fear of the outcome. Hi all thought i would make my fisrt post what a really great forum this is I have been learning so much from all this information keep up the good work. I spent all afternoon listening to your podcast and when you spoke about being in a relationship all by yourself I couldn’t help but to shout amen. That truly is the worst felling. Thank you so much your for wonderful advice. Hi. Thanks for checking in on the forum for Letting Go of Stuff. We are getting ready to ramp it up again. So stay tuned and check it out on Twitter as well. The link is http://twitter.com/lettinggopro.com. Be sure that you share this BLOG and the twitter link with others in your circle. Hi AE. Thanks for listening to the podcast at http://www.DarrenLJohnsonShow.com. I am glad it helped. @Areka. Happy New Year Areka. Have fun in Tennessee in 2013. Make lots of money, as I am sure you will. All the best. Trust is something that, in my opinion, after and act of infidelity, must be earned. Now keep in mind, I am going to respond specifically to your statement alone. I won’t get into the possible reasons “why” your spouse may have become an infidel, because that would involve taking at what happened between you two that led up to him going out on you. In other words, at some point you have to ask yourself, “what was lacking in the relationship?” Regardless of what may have been mission, infidelity is NEVER the answer, if you LOVE your spouse, and most importantly, if you love your SELF. BUT, let me focus on your statement/question of re-developing trust after infidelity. My response is based on the assumption that you are staying in this relationship. Okay? Now, before you attempt to apply the following steps, let me caution you, and suggest that you have a conversation with someone you trust about applying the steps. Get a perspective from someone you can trust and who truly has your BEST interest at heart. If you journal, then write about what you may do in your journal. As a matter of fact, share with your journal exactly what you will do, including the conversation and the potential responses. After sharing this with your journal (by writing about it), then let that simmer for a week or so before moving forward. Finally, before applying the following steps, remember that at some point in this relationship, you really loved, and may were even in love with your spouse. And if you plan to keep this relationship, then your goal is to get back to that place of love – somehow. This means that forgiving this person MUST be part of the process as well. So get ready to do some work in that area as well. That having been said, try these steps, that are not guaranteed to work, but are merely a suggestion to get you on the right track. First, you must let your spouse know the impact that act of infidelity had/has on you. One way to do this is to have a face to face conversation. BUT, make sure you are prepared to remain calm and be an adult during that entire conversation. And prepare yourself for the worst response you could ever imagine. That way, you can handle what ever your spouse may say. If you are the type that does not do well with face to face dialog, then you can write a letter to your spouse. In that letter, simply say what you can’t say in person. Remember to not allow your emotions to dominate either of those communication exchanges. Second, give yourself time to digest that experience, and to process the response/conversation that results from your effort to communicate about how you feel. It is not a bad idea to spend a couple of nights apart after you have that initial conversation or give him your letter to read. That may allow both of you to develop a different perspective. Third, go through the process of forgiveness outlined in my book, Letting Go of Stuff. It will be helpful for you to work through the pain, anger, and hurt you may be experiencing. Remember, it is okay for you to be angry and hurt. You have a right to your feelings. But also know that if you choose to hold on to them, then it can interfere with your ability to move forward in this relationship and enjoy what ever future you have with this person. Fourth, remember that you also had a role in this act of infidelity. Obviously not directly, but you have to examine what role you had that may have led your spouse to want to go outside the relationship. What was your role, if you play one at all? Fifth, give yourself time to heal after all of this. You deserve that time and you truly need to take it. Be open and honest with your spouse about where you are right now with regards to your feelings, your impression of him, and your thoughts about the future. Sixth, if you want this relationship, keep in mind that you must get back to the love that brought you together in the first place. That is important. NOW, these steps are not by any means a cure all. They are just designed to get you on the path of moving beyond your current situation. I wish you the very best as you let go of this and move toward your goal of a successful and happy relationship with your spouse. I’ve been reading the blog entries and many are filled with gratitude; however, I have a question. How do you let go of the inability to trust your spouse? Especially after infidelity? Thanks Artherine! I hope you come back and share/disucss what you learn/re-learn in the book. I am sure that others will want to hear about it as well. I hear you. Sounds as though you have your hands full with STUFF. It also sounds as though you are applying the fourth secret to Letting Go of Stuff, which is to have a GREAT attitude. You said a mouthful when you shared that WE tend to surround ourselves with STUFF, and sometimes it is in an effort to make up for the spiritual aspect of our lives; like filling a void. But the replacement is not nearly as valuable. Generally speaking, I believe that it is important for us to spend the time taking inventory of our INTERNAL STUFF. This will help to reduce the fear of facing that person we see in the mirror. In other words, if you want to change something about YOU, that means that you are going to LET GO of that something. But to know what you want to change, you have to first take an inventory of EVERYTHING that is going on inside of you. Then decide from that inventory, what you want to change. After that acknowledgment, you must then accept what ever it is you want to change, or LET GO. This is where it begins – for some of us. Wow, how fortunate. Your notified us of your blog on the 3 days I’d already labelled Give-a-Palooza 2007. Outside is a U-Haul Van, and yes, the storage area here at the residence and the rented one nearby, which serve for my home and home-based business, are getting emptied out and sorted out. There will be lots to share in great condition. Because lots is unused. Buying stuff and hoarding it is said to signify many things. One of the more salient ones for me is a lack of confidence in one’s own ability to be self-supporting and a lack of belief in the infinite supply that comes from the Divine. And clutter is something to hide behind, and a reason to stay stuck. So of course I’ve procrastinated about getting started each of these mornings. No matter. I’ll just work later…and keep focused on the expectation of lightness, freedom and joy that I will know for the first time in a long time, tomorrow night! Because that will be “it.” There is no more on the physical plane anywhere. Oh yeah, I’m taking pictures. As a reminder of doing something really, really right…..right now. Thanks for your fine work and your WP blog. Thank you for posting on my new blog. Congratulations! You are the first person to post. Let’s see where it goes from here. And by the way, I agree with you comments that people tend to be in denial about their stuff. Also, people tend to believe that everyone else’s stuff is much worse that theirs. Although that is sometimes true, it is also much easier to be critical of or to even judge other’s stuff, before taking a look at our own. It feels safer and sometimes allows us to feel better about ourselves when we find fault in others. Letting Go of Stuff is about loving your self. It is about forgiving the most important person you know – YOU. And a whole lot more. Thanks again for your comments and being the FIRST to post on my blog. A lot of people are always talking about what they wish to attain in life. Many of those people don’t realize there are things you may need to let go of in order to do so. 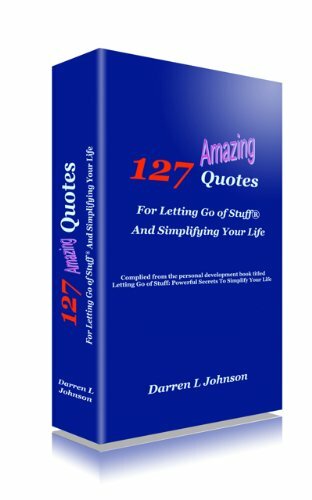 The guidance in “Letting Go of Stuff” has been very instrumental in helping people to identify those things that are holding them back. Definitely worth looking into! Looking forward to our dialog.